TOWN IMPROVEMENTS. Another handsome addition is about to be made to our list of hotels, the accommodation in connection with which has during the past two or three years been greatly extended. 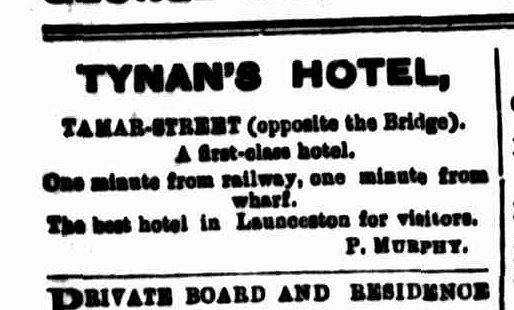 Tenders were opened on the 7th instant for a new hotel, which is to be erected at the corner of Tamar-street and the Esplanade for Mr. P. Tynan, and which will bear the designation of the All Nations Hotel. The successful tenderers were Messrs. J. and T. Gunn, the amount being £2500. Five other tenders were sent in. The building will consist of hotel premises, additions to shop, and a new shop. The hotel will have a frontage of 56ft. on Tamar-street, and 80ft. on the Esplanade. It will in all respects be of the Venetian and Elizabethan order of architecture, being cemented, with cornices, mouldings, architraves, imposts, entablatures, pediments, pilasters, and blocking courses. 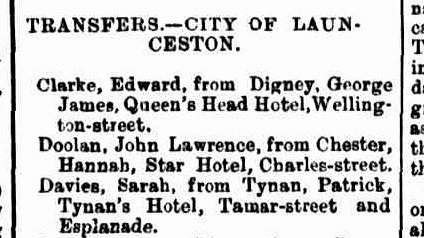 Town Improvements.— Tender’s for the erection of Mr P. Tynan’s hotel, at the corner of Tamar-street and the Esplanade, the designs and specifications for which were prepared by Messrs. Harry Conway and Son, were opened on Tuesday, February 7, six tenders being to hand. That of Messrs. J. and T. Gunn was accepted at £2500. The building will consist of hotel premises, additions to shops, and a new shop. The hotel will have 66ft on Tamar-street, 80ft on the Esplanade, and will have on the ground floor-bar, 29ft x 17ft; bar parlor, 19ft x 14ft; private parlor, 16ft x 14ft, store, 15ft x 14ft ; dining-room, 25ft x 14ft ; kitchen, 21ft x 16ft ; pantry, 11ft x 9ft 6in ; servants’ bedroom, lift 6in x 10ft 6in. 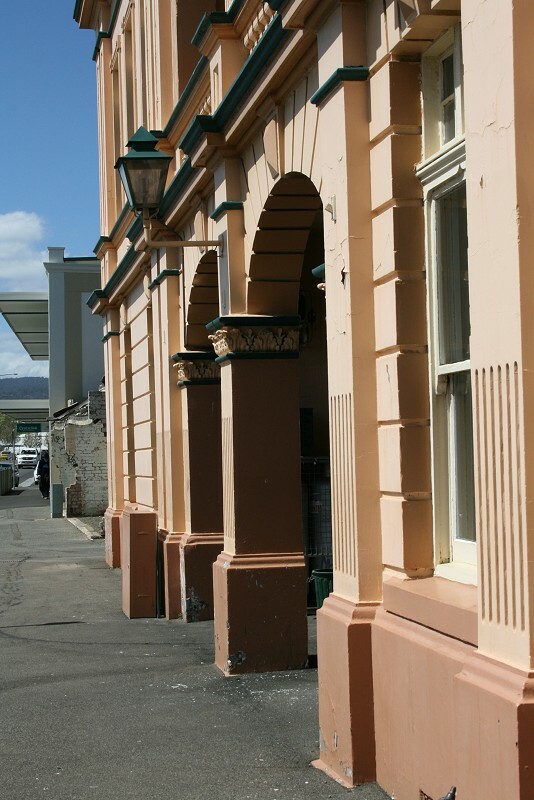 On the Tamar-street side there will be an entrance 5ft wide, and on the Esplanade an entrance hall 6ft wide leading to a staircase 9ft wide, with the usual verandah in front, 6ft wide. The staircase will be a massive newel stair, constructed of cedar and kauri pine, with moulded hand-rail and ornamental cast-iron balusters. The first-floor will consist of five bedrooms, 10ft x 7ft 6in ; three bedrooms, 14ft x 8ft ; and five bed rooms, 14ft x 14ft ; bathroom, 10ft x 6ft, with patent w.c. attached ; store, 8ft x 5ft, and three corridors 4ft 6in wide ; and from the landing will be a hall corresponding to the one downstairs, leading on to a balcony 6ft wide. The rooms will be 12ft 6in high down stairs and lift 6in upstairs. The front will be cemented with cornices, moulding, architraves, impost, emtablatures, pediments, pilasters, and blocking courses, and will in all respects be of the Venetian Elizabethan order of architecture. The front windows will be ornamented with the top sash in colored cathedral glass, and the entrance doors will have side lights and fanlights with ornamental figured glass. In the yard of the hotel there will be two urinals, each 6ft x 4ft 6in ; two patent w.c.’s, 6ft by 4ft, and wood and coal sheds 15ft 6in by 6ft. The yard will be asphalted and drained, so as to make the whole clean. The w.c.’s, yards, and sheds at back will be in all respects the same as for hotel premises. The present hay and corn store lately occupied by Mr O. Lloyd will be converted into a shop 18ft x 18ft, sitting-room 12ft x 12ft, and store 12ft x 6ft. The present right-of-way will have a shop 12ft 6in x 18ft and sitting-room 12ft x 12ft 6in, and at the rear of these will be two kitchens 10ft x 8ft. Upstairs over these shops will be one bedroom 18ft x 18ft, one 18ft x 12ft 6in, one 12ft x 12ft 6in, and one 18ft- x 12ft, with the necessary newel staircases. The front of this new portion of shops will be constructed to correspond with the present shops. 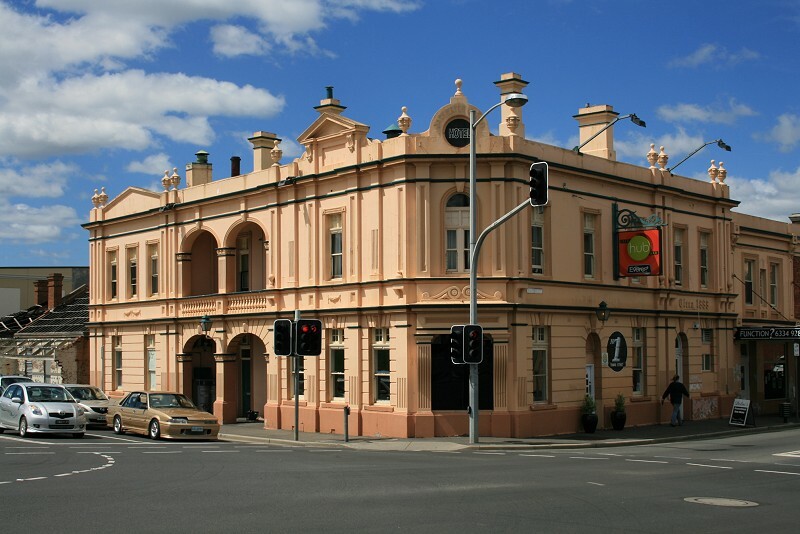 After a refreshing sleep and feed I made Campbell Town next evening in time for the Hobart to Launceston evening train, putting up at Tynan’s new hotel on the Esk, which is a very well appointed and comfortable house. Arthur Ellis, George Graham, and Richard Oldsworth, on remand from Friday, were charged with having on February 13 attempted to commit a felony by trying to rob the till of Tynan’s Hotel, occupied by Mrs Davies. They pleaded not guilty. Ellis was defended by Mr R. Byron Miller, and Graham and Oldsworth by Mr M. J. Clarke. 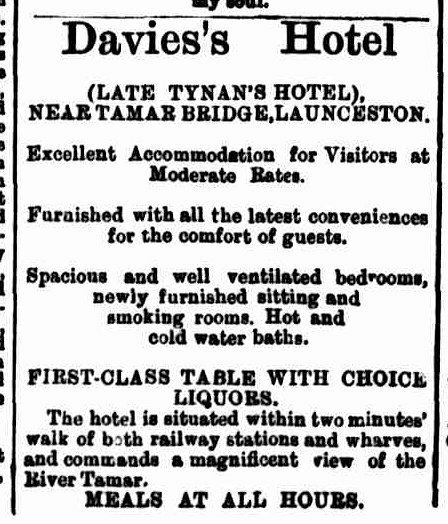 Elizabeth Mary Davies, daughter of Mrs Davies, of Tynan’s Hotel, Tamar-street, deposed that on Tuesday, the 13th inst., shortly after 1 p.m., the three accused came in for drinks, which were served; they paid for them, and she placed the money in the till; she then returned to the dining-room, and immediately heard the till bell ring; as she hastened back she heard the dinner bell ring, and when I she came out she saw Ellis ringing the dinner bell in the ball, and the other two outside the bar; the till was pulled out about an inch, which was as far as the patent lock would allow ; the bell of the till was a patent one, and they did not know how to open it to prevent the ringing of the bell ; Ellis afterwards went into the dining-room and had dinner; she asked him who were the other two men, and he 1 said they were strangers to him, and he E had given them sixpence to get a drink; Ellis was dressed in black clothes when he went to dinner, after which he went upstairs and put on a light suit, which he had on in court. City Police Court. — The only business at this court on Saturday was the the granting of a permit to Sarah Davies to sell liquors at. 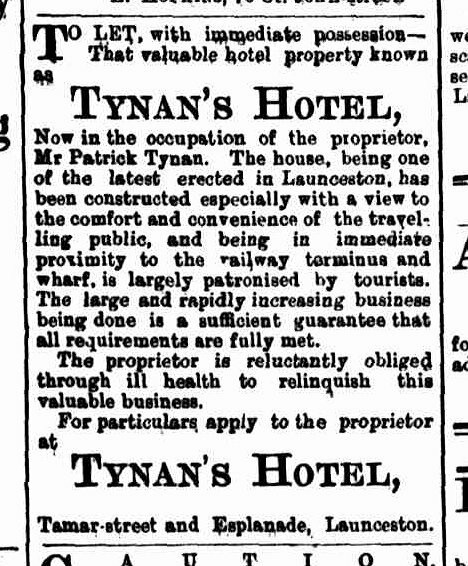 Tynan’s Hotel under the license; held by Elizabeth Mary Davies until the next quarterly licensing meeting. Messrs. E. Whitfeld, P.M;, and D. Ritchie, J.P., occupied the bench. 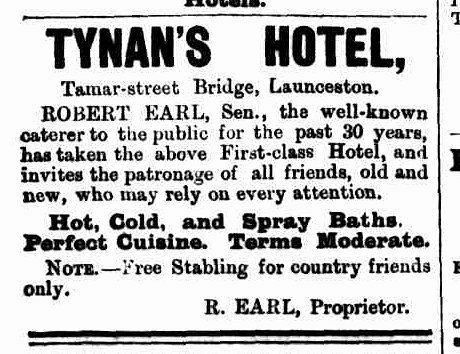 Robert Earl, sen., received permission to sell liquors at Tynan’s Hotel under the license held by Sarah Davies until next meeting of the Licensing Bench. Police Court.-The Police Magistrate and Mr. P. Boland, J.P., presided at this court yesterday. James Hudson, against whom there was a prohibition order, was fined 10s for having been drunk and disorderly the previous night, in default, three days’ imprisonment. 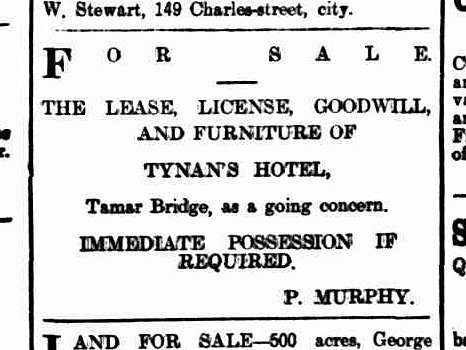 Permission was granted to Patrick Murphy, to sell liquors at Tynan’s Hotel, Esplanade, under the license by Robert Earl, until the next meeting of the Licensing Bench. Police Court.-There was no business to transact at yesterday’s sitting of the City Police Court beyond the granting to Mr. Patrick Murphy, licensee of Tynan’s Bridge Hotel, of a permit to sell liquors at, the show on the 3rd, 4th, 5th, and 6th inst. A dispute arising out of a betting transaction was ventilated at the Ponce Court yesterday, in a case in which Catherine Amelia Briley proceeded against Patrick Murphy for using indecent language. — Mr M. J. Clarke appeared for the complainant, and Mr J. H. Keating for the defendant, who pleaded not guilty. — Mr Clarke, in outlining the case, said that Sirs Briley had a money transaction with defendant in connection with racing, and on calling at his hotel for the money, the words complained of in the information were. used. — Catherine A. Briley, wife of George Briley, stated that’ she, had had dealings with the defendant through others. She went to his hotel on Friday night to see him. Waddingham was there, and he called defendant. She asked defendant if he was going to pay the money he owed her, and he referred her to a Mr Wright. She said she had seen Wright, and he sent her to him, and added that she wanted her money. The language complained of in the information was then used by the defendant, who pushed her into the street. To Mr Keating: She had been to the defendant once before. He told her the first time he had nothing to do with her, as the transaction was carried out by Sir Wright. She said he ought to nave paid her before.— Joseph Waddingham stated that he called defendant for Mrs Briley. He (defendant) went into the passage and told her to get out, but he did not hear him make use of any obscene words. Witness met Mrs Briley after she left the hotel, but did not sympathise with her, nor told her he had heard bad language. He heard defendant say something through the window about a bet. To Mr Keating : the defendant called her a bold woman, but nothing more. 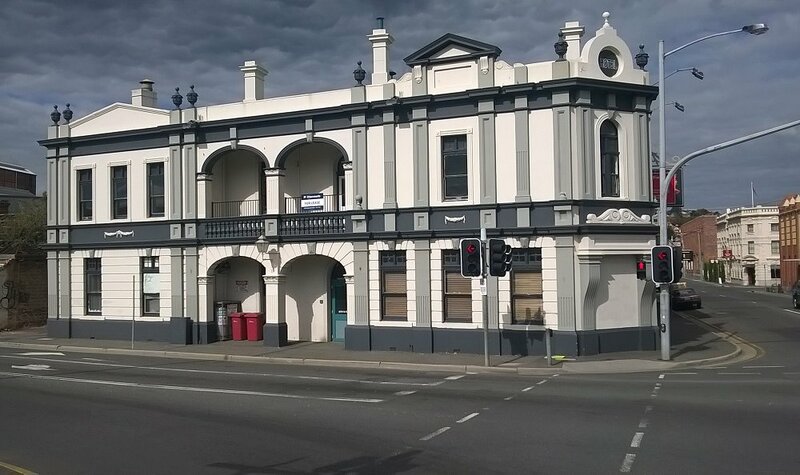 — For the defence Patrick Murphy, licensee of Tynan’s Hotel, stated that complainant called and asked about a bet with Mr Wright. She had called twice before. He told her to go away and see Mr Wright, but she persisted, and said she wanted her money. Witness called her a bold woman, and moved her to the door. He did not use the words set out in the information. — The Police Magistrate said the statements made by both parties coincided to a certain extent, although not as to the exact words used. The complainant had called at the hotel on bona fide business, and the Bench considered that the witness called knew more about the affair than he had stated. The Bench was of the opinion that the language complained of had been used, and the defendant would be fined 20s and costs, with 21s counsel’s fee. Patrick Murphy, licensee of Tynan’s Hotel, was, at the Police Court to-day, fined £2 and costs for Sunday trading. The young man who was caught carrying a can of beer from the hotel was let off with a fine of 5s. 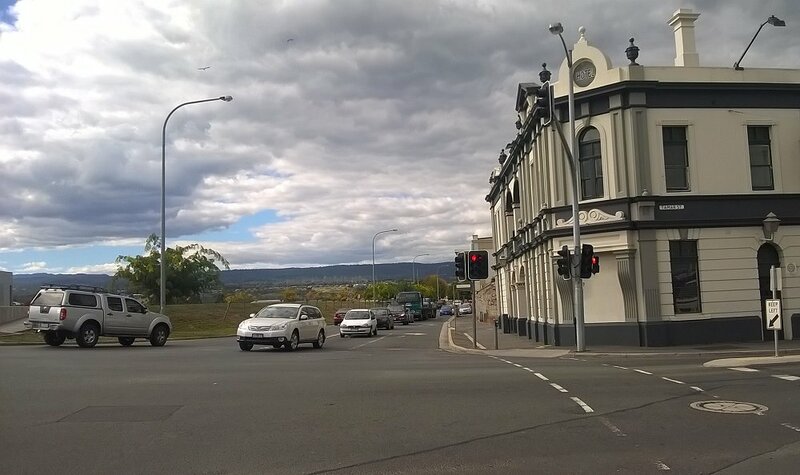 This entry was posted in Boland Street, Esplanade, Tamar Street and tagged location, photo by Xenith. Bookmark the permalink. I totally missed your comment. I’ve only just found it now. Sorry. I also totally missed the Examiner article. I’ve included the first few lines with the bit about the name. Thank you for pointing it out!